We are serious about a TBML league. Sups and I have decided to start a TBML! It's been quite some time since we had a league. I know several of us have craved some good old games. Thinktanks is basically dead, but it would be nice if we could meet up once a week for some good games. What a great time for a league! Yes, we are all rusty, but it will be fun. We are hoping to have a 4 on 4 season with five people on each team. That would mean we will need at least 20 players to have a successful league. There will be 6 season games (possibly 9 if people want). 1 preseason + 6 season + 1 playoffs + 1 finals = 9 TBML games. We are still working on the schedule, but games will start in mid to late march. The time and day for games is Monday @ 9:30 PM EST. Dazzle is hosting on his dedicated servers on the US East Coast. I know you may think this won't happen, but I am dedicated to making this happen. 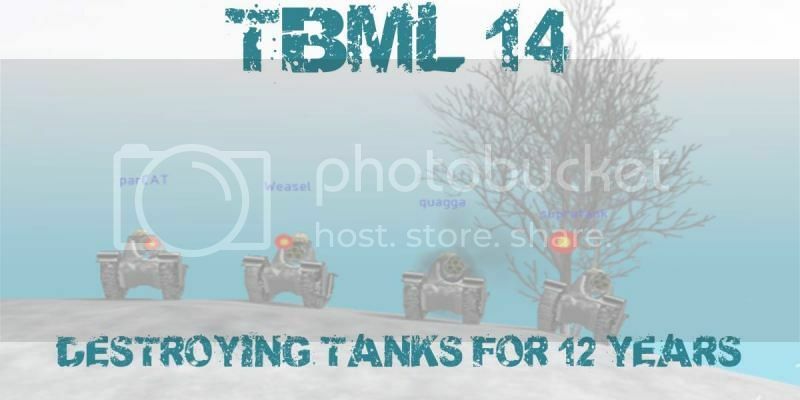 Even if you have not played Thinktanks in ages, I will help you get thinktanks running again and we would be happy if you joined TBML 14. I may be an old fart now but I think I can still pew pew with the big boys . Count me in! wow, we are stubborn if nothing else. Viva la Tanks! Well, I impulse visited this site, and now I am impulse joining this league ! I am rusty as all heck but count me in if anyone will have me! I am most surprised this website is still not DEAD. I have not played for years, but COUNT ME IN!!!! Be sure to drop me a line when this gets on its feet. I defiantly don't want to miss out!! I am very stubborn, this league WILL happen. I am pushing for 30-36 players now! SIGN UP PEEPS! Dash! Long time! Pre season will start March 29th! Hope all is well.